Ever wondered of this question? "More and more outbreaks are detected and traced. Most of them are new pathogens that people have barely heard of. Does that mean, new pathogens are evolving, our immune system is weaker, or simply our technological competence has drastically improved". Different people have varied opinion on this. I contest, with ability to sequence anything and everything, we are detecting the one's which weren't before. One of the recent talk of town in terms of infectious epidemic is an Enterovirus- EV D68, a respiratory pathogen causing paralysis. Enteroviruses are a genus of positive-sense single-stranded RNA viruses. They are sub classified into Poliovirus and Human Enteroviruses A, B, C, and D. They are sub-typed based on their serological profile. The classification is quite challenging since many strains are known to be recombinants between groups. A more molecular approach has been proposed for classification, however hasn't been widely accepted in literature. The first isolation report of EV D68, is from California in 1962. 4 children suffering from respiratory illness and were diagnosed with a new virus type which was later classified as EV D68. The number of reported cases has been very low, less than 80 in a period of 4 years (2009- 2013). On August 19, 2014 CDC was notified of a sudden increase in case (Link), in Kansas and Illinois reported to the CDC an increase in the number of patients hospitalized with severe respiratory illness by PCR. The age group was a pediatric population (20 months- 15 years). The interesting part was that it was correlated with Acute Flacid Paralysis, a Polio like condition. Nothing much was known about this virus. By a month nearly 700 cases were confirmed in 46 states in the US. By the end of October 2014, a Real Time PCR specific for the virus was used by the CDC to be used as a lab test. By Jan 15, 2015 CDC has confirmed a total of 1,153 people in 49 states. An article published in 2012 by Lipkin et al; analyzed multiple isolates genome and gathered that there is emergence of new mutants from a variety of geographical regions. Thus it wouldn't surprise me to see that we are seeing a lot of cases. However, so little is known of its biology. A recent article in Nature News titled "Mystery childhood paralysis stumps researchers", highlights the current effort in understanding the sudden increase in cases. The article highlights that there is neither a vaccine nor a approved specific treatment. Further, it is not known, as to how the virus causes flacid paralysis if at all it does. The evidences are quite circumstantial. Perhaps its too early to speculate. Just as papers began flooding with Ebola outbreak, I expect a lot of literature to shoot in for EV D68, in near days. In my opinion, Immunology is quite naive when compared to fields of microbiology, and the networks and components of the system is more complex. The players in immunology is often difficult in terms of understanding them, since many components have multiple functions. Some of the functions are contrast themselves and varies based on the context. When we talk about Immune cells, it is one among the following- Neutrophils, Monocytes, Eosinophils, Basophils and Lymphocytes. Among these, Lymphocytes represents structurally similar, collection of phenotypes. Broadly stating the lymphocyte belongs to T cell or B cell category, and rest are called as "others". It has recently become clear that these "others", represent a huge number of varieties. T- cells in itself is a huge collection. I have previously blogged about a set called Helper cells which belongs to a subset of CD4+ T cells (Link). Immune system is a learning based defense system. But to learn, the immune cells take sometime. The time lost in having to learn the defense is compensated by the innate defense system which is not so effective. Here is the interesting point. Researcher's are now slowly discovering a set of players that falls in a middle category. They are usually known as invariant cells. Probably the NK (Natural Killer) cells are more familiar to the reader in that category. But more recently I was introduced to another- MAIT cells, which is taking up a center stage in immunology field. 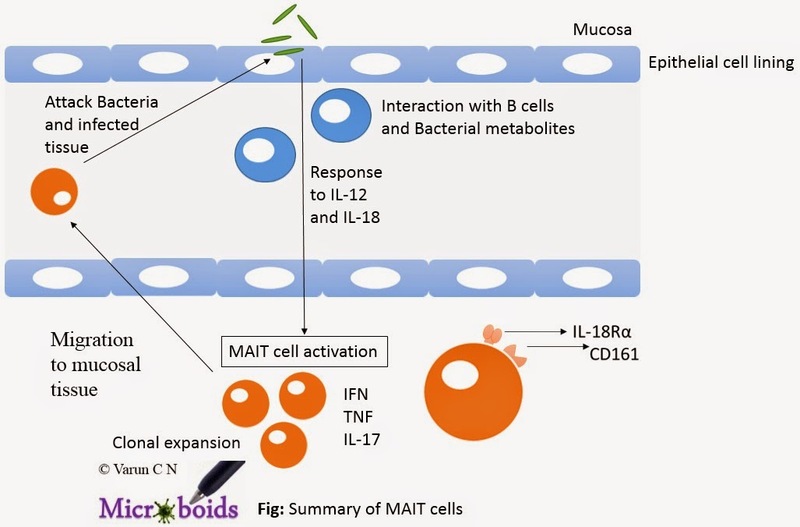 MAIT stands for "Mucosal associated invariant T cells". They form roughly 5% of cells of circulating T cells. They are characterized by the expression of a semi-invariant TCR (Vα7.2-Jα33/12/20) that recognizes the evolutionary conserved MHC-related protein 1 (MR-1), which is receptive for bacterial antigens. They express mainly CD161 and IL-18R. They maybe considered as a member of non-classical T cells. Their response is not determined by priming and hence you may consider it as innate cell. This means they have a ability to respond to a wide variety of pathogens from Mycobacterium to Candida species. The mystery of how can a receptor recognize a broad range was solved by studying the structural aspects of MR-1. It showed that MR-1 basically recognizes microbial metabolites of riboflavin. These metabolites (for example reduced 6-hydroxymethyl-8-D-ribityllumazine, 7-hydroxy-6-methyl-8-D-ribityllumazine and its precursor, 6,7-dimethyl-8-D-ribityllumazine) are potential MAIT-activating ligands. To put in a simple language, the MAIT cells are recognizing a totally new set of antigens which can be sensed very early. Remember Vitamin components are widely available in mucosal regions and their microbial metabolites is a very good candidate for immune system to survey in mucosal context. The interest in MAIT cells comes from a variety of angles. From the point of basic Immunobiology, MAIT cells were not observed in germ-free mice or in germ-free mice repopulated with bacteria's. They secrete IL-17 which can stimulate Th17 cells, known players of antibacterial immunity. Interestingly, MAIT cells is not a homogenous variety. It comes in CD4+ and CD8+ varieties. Further, MAIT cells require B cells as well as commensal flora for their peripheral expansion. From a clinical perspective, MAIT cells is thought to play a protective role in Multiple sclerosis and a pathogenic role in arthritis. Mucosal immunity is an important emerging area of understanding HIV pathogenesis. There is a consistent evidence of MAIT cell depletion in HIV cases. Antibiotics have been such an important part of the current clinical practice, that it is unimaginable to see how we could do without it. With warnings of post antibiotic era fast approaching (Link), there is an attempt made to bring more chemicals in the list. The faster rate of antibiotic approval remains the same. Several new compounds have been approved for treatment. But the problem remains the same- Antibiotic resistance. I have previously blogged about why halting resistance to antibiotic doesn't look like a possibility (Link). However, the current talk on web pages is that a new chemical Teixobactin has pulled it off. Somebody called it resistance to antibiotic resistance. There are 2 possible ways where you make antibiotic discovery. First, you synthesize chemicals unheard of in nature or a modified chemical from what already looks like a good antibiotic. Second is to tap into the microbial communities that have been producing antibiotics for self defense. But here's an important catch. More than a 99% of bacteria is unknown to science. All we know is they exist, through DNA sequencing approaches. These form a chunk of untapped resources. But to identify biology and chemicals of interest, from these we must first grow them. And they don't grow in laboratory conditions. Apparently there is a dual problem of interest. The first part is how to culture the so called non cultivable bacteria, and the second using them to find chemicals of interest. But despite heroic efforts there seems to be a large percentage of bacteria that simply refuse to grow in a pure culture. The best example are soil microbes. It is believed that chemicals from one bacteria might somehow support the other and so probably they cannot grow in isolation, no matter how good the condition is. Thus study of these organisms have been hindered and the information they contain, is called as "Dark microbial matter". Fig 1: Isolation chip for microbial cultivation. The technology to cultivate at least 50% of such non cultivable bacteria comes in the form a method called as Ichip (I chip stands for isolation chip, and its not an apple product). The Ichip is an insitu diffusion chamber. The basic design is composed of several hundred miniature diffusion chambers. By diluting the sample to a degree that will allow 1 microbial cell per chamber, it is possible to achieve isolation. On other hand since it is made up of a semi permeable membrane, it tricks the microbe to its natural environment, thereby inducing growth. There have been modifications of this original method, which are reported. For example, MicroDish Culture chip (MDCC) is a disposable microchip which can serve as a micro petri dish, The MDCC20 accommodates 1000 compartments . One more example that I can think of is SlipChip. Once a micro-colony can be obtained it is possible to grow them in larger numbers. That looks like a pretty good solution to a complicated problem. The researchers using this knowledge, worked on trying to isolate soil microbiome. Extracts from 10,000 isolates obtained by growth through Ichip were further screened for antimicrobial activity against S aureus. During the screen they hit upon 25 potential chemicals. One of them was Teixobactin. The source organism was a β-proteobacteria provisionally named Eleftheria terrae. The researchers have done a lot of additional work to characterize the organisms biochemical pathways, entire genome and the chemical. However, it is not relevant for this post. 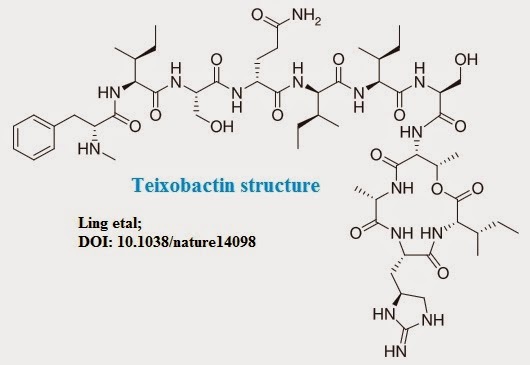 Teixobactin strongly inhibited synthesis of peptidoglycan hinting that it acts by attacking the cell wall. Experiments show unlike Penicillin class, these specifically interacts with the peptidoglycan precursors (decaprenyl-coupled lipid intermediates of peptidoglycan). The compound was exceptionally active against C difficile and Bacillus anthracis (MIC in ng/ml), and high activity against Streptococci, Enterococci and M tuberculosis (MIC <1 mcg/ml). 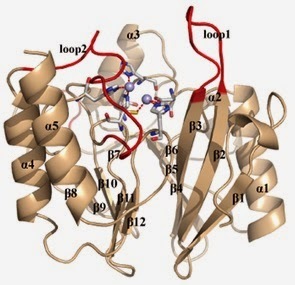 The activity against TB is probably explained by the drug binding capabilities to precursors which are common for peptidogycan and arabinogalactan. However, they seem to be of no use against Gram negatives where the concern is higher. 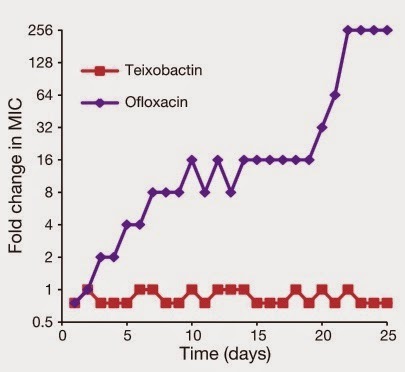 Drug resistance experiments, using serial sub MIC method, for 28 days in comparison with ofloxacin is strikingly distinct. There is almost no signal of resistance. This is the experimental for claims "Resistance to resistance". Its my opinion that Ofloxacin against which comparison is made is not a good way to do this experiment. The Resistance acquisition experiment should have been shown with vancomycin and daptomycin which would have been a better and crisper comparison. Moreover ofloxacin is a fluoroquinolone which acts through a totally different mechanism. Experiments have also been done to show that it is not toxic. Teixobactin attacks lipids in cell wall, a highly fundamental part of the cell, because of which development of resistance can be slow. However, to call resistance will never emerge, is very difficult point to make. As Wright states in nature news "“I don’t believe there’s such a thing as an irresistible antibiotic, but I do believe that certain antibiotics have a low frequency of resistance". Moreover, this is a isolate from soil microbiome. A resistome is definitely out there. Outside the purview of this post, I want to digress syaing there is a way of predicting resistance in-silico. This is a software - called OSPREY which predicts the most likely mutations that a bug develops in response to a new drug before the drug is even given to patients. It would be interesting to see if someone did the check to see what the software predicts for Teixobactin. This paper will inspire more such studies alike and maybe will uncover a potential drug against the gram negatives. It is also intriguing to me what would have they found if they had screened the chemicals against say a MDR Klebsiella species. Someone needs to do that experiment to see if there are anti GNB's of interest. I'm sure there will be at least a handful of interesting candidates. In the era of antibiotics, the factor of drug resistance is a matter of discussion. The problem has escalated from the resistance to a couple of antibiotics to Pan drug resistance, which means there is nothing in the approved antibiotic pipeline that can be used. In desperation, attempts have been made to use research drugs. Literature is full of examples. A point has come where the types of Antibiotic resistance has become a database in its own right. In general, gram negative bacteria tends to have resistance to a wider range of resistance than the gram positive types. Fig 1: Structure of NDM-1. 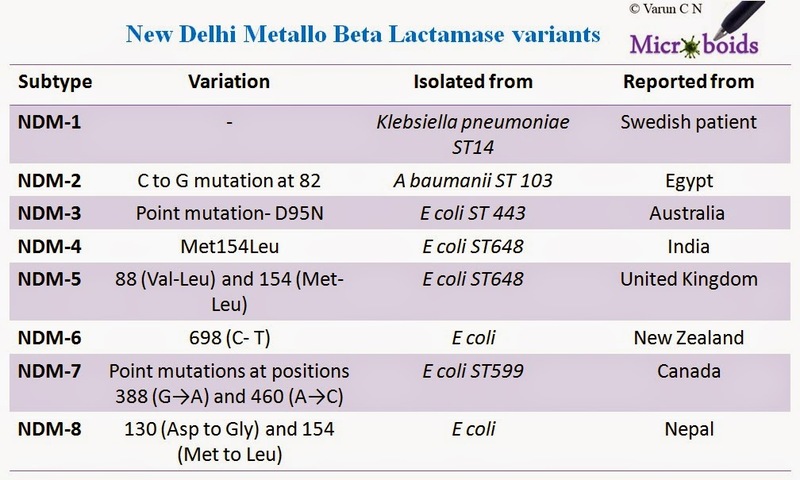 Of these, one of the most recent discovery is a resistance type- NDM (New Delhi Metallo Beta Lactamase). Its is a molecular type B- β lactamase. Unlike other molecular types (A, C and D), this enzyme has zinc ions at its active site, and it can hydrolyze most of the β-lactam drugs. Moreover, it has been seen that the organism carrying the NDM phenotype, is also resistant to multiple other drugs. Claims have been that NDM positive isolates have up to 14 other antibiotic resistance determinants. This makes them a formidable opponent to antibiotic treatment. One of the most relied drug of use against drug resistant bugs was the carbapenem class. Though carbapenemase phenotypes were known before the discovery of NDM, it was the most versatile of all. The first case was demonstrated in 2009, in a Swedish patient. It has been suggested that NDM carrying plasmid was circulating in New Delhi as early as 2006. The original identified sequence is called as NDM-1. NDM-1 has been demonstrated widely in multiple geographical regions and multiple species. It appears from the literature that a large chunk of cases are represented by Klebsiella species, E coli and Acinetobacter species, predominantly from Asian countries. Antibiotic resistance is a phenomenon tagged with antibiotic use. Though it has been argued that the chunk of first described cases were associated with India, it is unfair to claim that the strains have originated in India. Rightly so, the nomenclature stirred a huge debate and Lancet editor apologized for publishing by that name. It has been proposed that NDM should be renamed to PCM (plasmid-encoding carbapenem-resistant metallo-β-lactamase). However, the term NDM is extensively engraved in the literature. The original sequence of NDM, has spread across the globe and variants have been emerging. To the best that I know of to date, there are 8 varieties of NDM (named from NDM-1 through 8). I have provided a summary of the features in table 1. As you can see from the table, the variation in NDM is just 1 or 2 point mutations. Since mutations are common (as you can see from ESBL subtypes; there are a zillion differences), does designation as a variant hold. Studies have shown that each variant has a different profile of resistance with varying MIC. Also the structural stability kinetics of the enzyme themselves are significantly different between each, and hence designation into separate entities qualify.